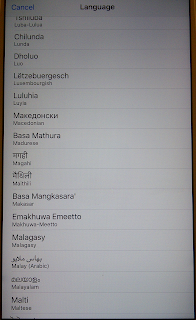 Here is an updated list of African languages on iPhone 6s+, with six more languages: Lunda, Luo, Makhuwa, Teso, Timne, and Tsonga. Given how these are bunched, it is possible that I missed them in compiling the previous list (posted last December). In any event, there are now 80 in total, all in the "Other languages." None of them are present as iPhone languages - which means that support needs third party apps. Four important languages I noted missing from the list last time are still not on it: Amharic, Hausa, Kongo, and Tigrinya. I'm still working on the two follow-up posts to "Really smart mobiles know African languages, Part 1," which was also posted last December.